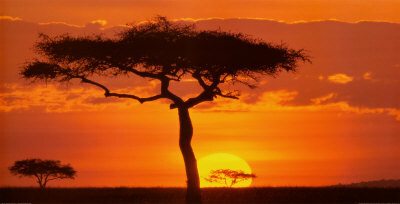 Masai Mara is without question the most popular of the Kenyan parks and reserves. Hardly any other Kenyan wildlife park gives better options to see all of the Big Five (elephants, lions, leopards, rhinos and buffaloes) in one place. The park has probably the biggest lion concentration of Kenya. Moreover, the world-famous wildebeest migration can be watched here every year. The downside are lots of tourists, and little (but still some) opportunities for budget travelling. Masai Mara gets it’s name from the famous Masai tribe, which have come to be an international symbol of African tribal life, and the Masai river which divides it. 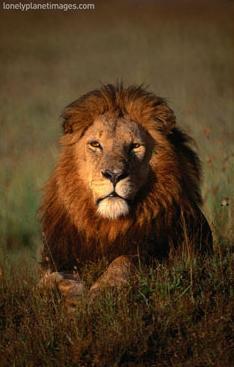 Masai Mara is located in the south of Kenya, at the Tanzanian border, 140 miles (225 kilometres) south-east of Nairobi. The reserve is a part of the Great Rift Valley, which extends throughout the entire African continent. The reserve consists mainly of open savannah (grassland), with clusters of the distinctive acacia tree in the south-east part. Most tourists visit the eastern part of the park, is this is closest to Nairobi, where most safari travellers fly in. But most wildlife is found in the western part of the park, which is more swampy. So give that a try if you want to avoid herds of tourists. Masai Mara is a reserve, not a national park, which means it’s managed by the local county councils instead of the national Kenya Wildlife Service (KWS). Masai Mara is world famous for the annual wildebeest migration, taking place in August-September. It’s one of the biggest wildlife spectacles on earth. Every year over a million wildebeests, as well as hundreds of thousands of gazelles and zebras trek from Tanzania to Kenya, right through the Masai Mara reserve and back again in a big circle. Every year they suddenly assemble on Serengeti plains and then start to move all together, as if a mysterious sign has been given. Hungry lions and hyena follow the trek. However, in many places there are as much minivans as animals. All of the Big Five can be spotted here, with an relative strong presence of lions compared to other parks, although the black rhino population is severely threatened with only 37 animals counted in 2000. Herds of zebras are found throughout the park, as well as Masai giraffes and the common giraffe, hippos, warthogs, jackals, hyenas and bat-eared foxes. Numerous antelopes can be found here, including impala, Grant’s, and Thomson’s gazelles, hartebeests and topi. Additionally, over 450 bird species are present in the reserve including vulture, ostrich, the long-crested eagle, pygmy falcon, secretary bird, marabou, etc. Wildlife drives are an integral part of the Masai Mara experience. All top-end loges and camps offer their own tours. It’s cheaper to book them while reserving your nights, than to book them separately after arrival. Only book in advance with the upmarket places, however. Two-hour drives typically cost $35 per person, plus park fees (see below). Some traditional Masai villages in the reserve can be visited for a tea ceremony or a traditional dance performance. However, don’t expect any ‘authentic experience’ as shown in movies like “Out of Africa” or “The White Masai”. The people there are poor and often treat tourists as cash cows. You’ll have to pay $15-$20 per person for the visit and after arrival the villagers will often pressure you to buy all kinds of things. One method is throwing wares in your lap and refusing to take them back. If you can get over this and actually sit down to talk to them, it often gets better and you can have an interesting experience. Balloon safaris are the newest in safari chic. For around $450-500 you’ll fly over the Masai Mara for typically 60 to 90 minutes in the early morning, as this gives the best opportunities for wildlife viewing. You’ll have a great view over the animals while you glide over them. However, balloons are obliged by law to keep a certain height so as not to disturb the animals. Breakfast after landing is included. Operators are Adventures Aloft, Transworld Kenya, and Mara Balloon Safaris (who will cook your breakfast on the balloon burner after landing!). Horse riding and bush dinners are possible to book from most of the upmarket lodges and tented camps. You can hire a Masai moran (warrior) for guided walking tours. These take place outside the reserve, but there’s still plenty of wildlife around there. Many visitors report a great experience. Masai Marai is mainly geared towards high net worth visitors. Most lodges and tented camps are top-end. Advisable are the Siana Springs Intrepids, the Keekorok Lodge, who are comfortable without spoiling your bush experience with too much luxury. The Sarova Mara Lodge is overtly luxurious. Basecamp Masai Mara is a (top-end) ecolodge, the only one in the reserve, and a very good place to be. Choices for budget travellers are limited to the few campsites around the Talek and Oloolaimutiek gates. Camping at Simba Camp is $12 per night. Besides camping, the Acacia camp also offers twins/doubles for $35 / $40 per night. Take care with camping: as most of gates are inside the park, instead of at the border, tourists regularly enter the park without knowing it. While they think they are camping outside the park, suddenly a park warden comes up and demands that they buy a ticket. Entry fees are for non-Kenyans $80 for adults, $45 for children (per 24 hours). When you enter, ask for a receipt, as you’ll need this to pass between the Narok and Transmara sections of the reserve, and to exit Masai Mara.